This is my first post, so first I would like to thank Angela Shelton for the opportunity and including me as a contributor. As some of you may have heard in our recent conversation on Social Media Hour, we discussed resourcing tools for women recovering from trauma. We discussed the importance of using the language * thriving* instead of just surviving, how turning the language even further towards empowerment is one of the key points during a woman’s recovery process. I understand this both through my work and from my own experience. I am a survivor … and a thriver. I have worked with thousands of women on this topic and understand the difference between the two. For purposes of educational experimentation, we might look at survival as a woman just getting by. She is victimized and in major pain. She has not gotten to the point of fully resourcing and feels depressed. The trauma has taken over her, instead of her taking over it. She has lost control, she is out of control and she feels like dying. Anyone who has ever experienced this degree of trauma can relate here. Although not all trauma is like this, I think you get the gist of what I’m saying. Survival is a way to look at your trauma, however it might not the be the best way to sync your mind around healing it. For example, we could say survival is a part of getting by while fighting your demons. I respect that part and am not saying surviving is *bad* or unjust. It is necessary. My aim is more about honoring the victim side while at the same time giving you power to change how you think about it. I also understand that this may be hard if you are at the beginning of your process, or have not fully recognized your power, but nevertheless, wherever you are, I invite you to begin. For the purpose of the conversation I begin with you here today, the key is to begin to think of surviving as not just getting by, but as a way to notice that you are at the beginning and have taken the first step. Some of you may disagree, and if so, perhaps you can instead think of this as an exercise in semantics. I’m offering a new word, a new definition and thus a way to think about it differently. My aim is to educate and inspire you to take control, to take charge of your inner beauty by being fierce in your recovery. This means beginning to understand that the things you *say*, to yourself and others, *matter*. So, if you think of yourself as just a survivor, you are in fact limited to that belief. Survivors just get through. That is not what I believe any of the women reading this are doing. In fact, it is my belief that we are all thriving, and if you don’t feel like this, allow me to give you some evidence that you are, indeed, a thriver. 1. You are either part of this website, a visitor, or have come across this blog and am thinking about what I’m saying. No matter what your reaction is, that is okay. You can have it! This still means you’re thriving even if you don’t agree. Point is, by reading, writing, talking with friends, or listening to others share their stories, you are *engaging*. Although you might not be *active* or *good at it*, or *perfect* yet, none of that matters. What matters most is living *right now* outside of denial. You can’t be in denial if you are reading this. Part of you at least has to be actively conscious to even be interested in this point. 2. I ‘ve seen many people come to me over the years and I will tell you all of them are incredibly brave, bold and scared out of their minds. The point is that in order to thrive, you *must* be scared. It is part of the territory of overcoming your demons. This is where I hope to come in. 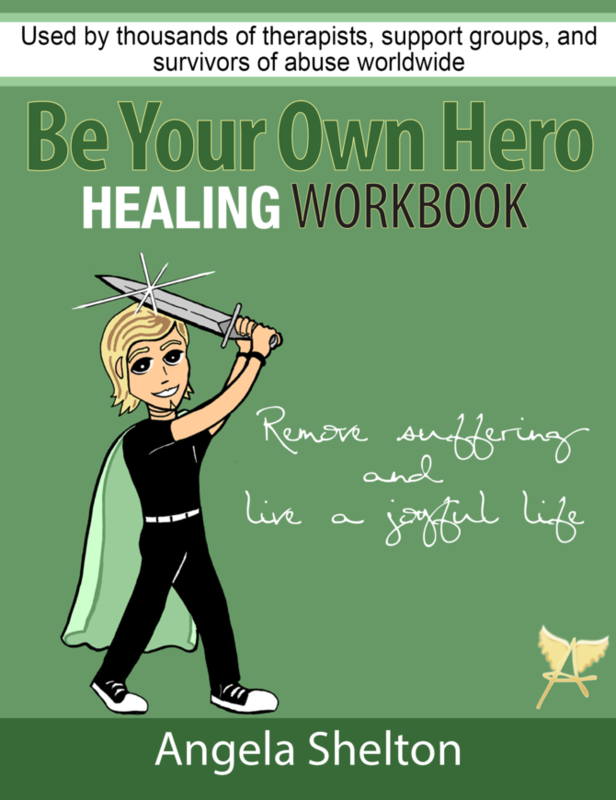 Overcoming your demons and moving *through* your trauma is something with which I can help you. Again, the first idea is to begin to change your *thoughts* about the *word* surviving and move into a place of recognition (even if it is just a little bit) in yourself that you just might be a thriver. A thriver does not have to be someone holding a sword above their head, (although i like this image), but anyone who is even *thinking, feeling, reading, or even slightly engaging* in any type of discourse around their pain of trauma. My job is to educate you on how to think differently about what you are currently undergoing without losing touch with what actually happened. I’m here as a resource for you and am happy to listen, encourage, respect and honor you and your process wherever you are. So that’s our first lesson – a lesson in language and how changing the words can change your thoughts. We’ll certainly return to language through this process, and in my next post I’ll share ways on how you can take action in doing this. I honor your process wherever you are in it and tip my hat to everyone out there having the courage to thrive instead of just survive.